Learn more about Riverside, California using the City Guide below. 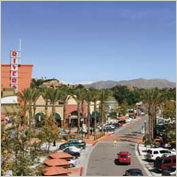 Plan a trip, find local shopping centers, or just discover what makes Riverside, California so great! Riverside is a large city in Riverside County in Southern California. With a population of over 200,000, the city plays host to a diverse cross-section of people, and has a unique and rich history. The area developed separately from Los Angeles as a result of various factors, and has taken on a distinctive character to match. It is a center for higher education, with one community college, a large state university and two private universities in the city. It is a hub of regional commerce and transportation. It is a city with an intriguing past and a promising future, and it is worth a visit. Stop by sometime! Riverside is a short drive away from Ontario International Airport. This medium hub airport has direct flights to many domestic cities (and Mexico! ), an uncrowded terminal, and generally easy freeway access. Travelers interested in flying in to Ontario should probably look into Southwest Airlines, as they occupy most of Terminal 4. If your destination is specifically Riverside, flying in to other Los Angeles-area airports is possible, but not recommended. Los Angeles International and Burbank are both located in Los Angeles County, over an hour's drive away without congestion, and the same can be said for Orange County's John Wayne Airport. If you have your own aircraft, Riverside Municipal Airport is centrally located and offers easy access to the city. No commercial passenger flights currently serve this airport. After arriving at the airport, getting to Riverside almost certainly requires navigation of Southern California's infamous freeway system. Follow the signs for Interstate 10 East, then get on the I-15 South, and get on the CA-60 East. You will spend only about 2 miles on the I-15, so stay in the two right-hand lanes. After that interchange, you're only about 15 miles outside of the city. It is possible to take public transport from Ontario International to Riverside. However, it is most certainly difficult. For frugal travelers, here's the information. Take the airport shuttle around to the Omnitrans bus stop on Airport Dr, and wait for the Omnitrans 61 bound for Ontario/Fontana. This will cost you $1.15, exact change only. Get off at the Ontario Mills transit center, near the mall. Board either a red Riverside Transit Agency route 204 bus (peak hours only) headed towards "Riverside", or an Omnitrans route 90 bus headed towards "San Bernardino/Riverside." The first, which only runs at peak commute hours, will cost you $2.25 and take about half an hour. The second, which runs all day, 7 days a week, will cost another $1.15, but will take around two and a half hours. Either will eventually drop you off at the Downtown Riverside Bus Terminal. Riverside has a Greyhound bus terminal located between Mission Inn and University Avenues in Downtown. This is a full-service terminal with routes to most domestic destinations, ticketing, snacks, and a restroom that they will let transit customers use, as the Greyhound terminal is across the street from the main city bus terminal. Riverside is a hub of the Metrolink commuter rail system, served by the Riverside, 91 and IE/OC lines on weekdays, and by the San Bernardino and IE/OC lines on weekends. The Metrolink station is about a mile outside of the city center, with ample parking. The only facilities available are public telephones and ticket machines- no restrooms. The station is served by Omnitrans 90 and RTA 1, 16, 16E, Trolley 52, and CommuterLink 208. There is a second Metrolink station, Riverside-La Sierra, in the south of the city. It is served by the 91 and IE/OC lines on weekdays, and the IE/OC line only on weekends. It has the same facilities, and is served by RTA 15. Interesting to note is the city utility has installed solar generating arrays over much of the parking lot. Amtrak serves the Downtown station with one trip per day on the Southwest Chief. Arrival from Los Angeles/Departure to Chicago is at 20:03 each evening, and arrival from Chicago/Departure to Los Angeles is at 05:48 each morning. Traveling to Riverside from out-of-area by rail is not convenient or cheap, but it can be done. Note that no Amtrak personnel are available at Riverside station- if you are boarding the train in Riverside you MUST have your ticket in advance, either by mail, web, or visiting the staffed station in nearby San Bernardino. We are Southern Californians here, and, like most Southern Californians, we are slaves to the automobile. Most of the time, getting around in Riverside will involve some form of car, even though traffic congestion will ruin your day and poor driving habits of others will make you want to use your vehicle as a lethal weapon. Given the fact that you're a traveler, natives will be comforted by the fact that you're driving a rental. The CA-60/I-215 runs along the north side of the city. (Confusingly, the two freeways merge at the Riverside 60/91/215 interchange and then split again at the Moreno Valley Interchange, which is still actually within the city limits.) The Market Street exit provides access to Downtown, the 3rd/Blaine and University exits allow easy entry into the University neighborhood, and the Box Springs exit will allow you run of the mostly-residential Canyon Crest area. Note that if you proceed on the CA-60 just past the interchange, get off at Day Street and you'll arrive at one of two area malls, the Moreno Valley Mall. It isn't in Riverside proper, but many people shop there rather than brave city traffic to go to the Galleria at Tyler. Once again, while the vast majority in the city do use automobiles, there is public transit available in Riverside. The Riverside Transit Agency provides fixed-route bus service on around 15 routes in the city, as well as three express commuter services and a few new community-based trolley-bus routes. Trips up and down Magnolia Ave. on route 1, on University Ave on route 16, and on route 15 along Arlington Ave are relatively frequent, with 20, 30 and 40 minute headways respectively. Weekends and other routes can cause more delay. A note of warning- the Riverside transit infrastructure essentially stops at 20:00. There is simply no service at night. If you're planning to be out late, make sure you have a way home. The system has two main hubs- the Downtown Terminal in the city's Downtown, and the Galleria at Tyler in the south of the city. Chances are you will have to travel through one of these transfer points to get anywhere in the city. Commuter express routes 204 and 149 stop at the Downtown Terminal with destinations of Montclair/Ontario and Orange County, and 149 and OCTA 794 stop at the Galleria, both headed towards Orange County. Local routes serve all surrounding areas. Taxis have been known to congregate on Fairmount Ave. between the Greyhound and city bus terminals. This is helpful if you end up caught by the sudden unavailability of public transport at night. Trip planning is available on the web site, and by calling 1-800-800-7821 between 07:00 and 19:00 M-F, and 08:00 and 17:00 weekends. Downtown Riverside boasts of four museums in the area. The Riverside Metropolitan Museum is entry by donation (suggested $2), with rotating exhibits on various topics and standing exhibits on local history, geography and culture. It's a half-hour's walk-through, but well worth the price. The Riverside Art Museum has rotating exhibits featuring a variety of local artists, including projects from the University of California-Riverside. Admission is $5, seniors, students and children under 12 free. The Mission Inn Museum is on the ground floor of the historic Mission Inn, and showcases the history of that building, including a chair that was crafted for President Howard Taft, whose girth is legendary. Admission is a $2 suggested donation. The UCR-California Museum of Photography is also located downtown, housing a rotating collection that centers on- what else- photography. Shutterbugs and their fans will enjoy a walk through this small museum. Admission is $3, UCR students and children under 12 free. The University of California- Riverside has an impressive Botanical Garden hidden in the hills above the campus. These gardens are usually lightly visited and offer impressive views of the city, as well as a large collectio of flora. Parking is highly limited and metered at $0.50/hour. Admission is by donation, with $1 suggested. The California Citrus State Historic Park provides a look back to the time when orange groves dominated what is now the city of Riverside, and reminds us where Orange County got it's name. A small museum resides at the center of this park, surrounded by a working citrus orchard. Day use fees are $4. If you go, be sure to pick up a sack of fresh oranges, which should run you around $4-$5. Riverside is the birthplace of the naval orange, and we still do it best. Speaking of that "birthplace of the naval orange" stuff, the original naval orange tree, to which all other naval orange trees trace their lineage, is still growing. It's on a traffic island on the corner of Magnolia and Arlington. There's a bench and a marker, and you can pick oranges off it- if any are ripe. Just don't take them all, it's rude. Riverside has many activities to occupy your time. The local amusement park, Castle Park, is located just off the 91 freeway at La Sierra and a short walk from the 1 and 15 buses. It has a small roller coaster, as well as numerous carnival-like rides, a log flume ride, an arcade, and miniature golf. An unlimited ride wristband will run adults $20 and children around $14, depending on height. Hiking and biking are available in the Box Springs Mountain Preserve, a large open space to the north of the city. Trailheads are accessible at the end of Big Springs St. and Blaine St. as well as off of Central Ave and Chicago Ave. Parking is free, but trail information is scarce. A popular pastime of local college students is hiking to the large, concrete "C" on the side of Box Springs Mountain. What they do while at said location is their own business. Local concerts are often held in various venues around the city. The college's independent FM radio station, KUCR 88.3, has a reasonably good listing of cultural events in the area. There are a few night clubs around the city, most notably Club Sevilla off the 91 at University, near the Metrolink station, El Castillo off of Chicago and University, and Incahoots, a few blocks south of the Galleria at Tyler on Magnolia. The City of Riverside Parks and Recreation department maintains a number of park facilities around the city, with the crown jewel being Fairmount Park. Fairmount, just off the 60 freeway at Market St. and served by the 25 and 29 buses, was designed by Frederick Olmsted, the architect of New York's Central Park. Other facilities, including skate parks, pools, and sports areas, dot the city. If all else fails, the Riverside Public Library has the third-largest collection in the southwestern United States, after Los Angeles and Las Vegas. Just visiting the Main Library in Downtown Riverside is an architectural treat. The Downtown area, centered around the Downtown Pedestrian Mall, consists mainly of upscale and specialty shops. It is an entertaining walk, but in most cases serious shopping is better left to one of the local malls. This area is just a short walk from the Downtown bus terminal (routes 1, 10, 12, 13, 14, 15, 16, 22, 25, 29, 49, Omni 90, 149, CommuterLink 204), and can be accessed via the Market exit off of the 60 freeway, and the University exit off of the 91. It is also served by the Red and Green line trolleys, routes 50 and 52 respectively, running around the downtown area for only $0.25. The new Riverside Plaza is a small collection of mostly upscale shops and restaurants just off the 91 freeway at Central Ave. It is anchored by Gottschalks, Vons, Borders and a 16-screen cinema. It is served by bus routes 1, 12, 13, and 14. The Galleria at Tyler is the largest shopping center in the area, a two-story mall with nearly every store one can think of, as well as large commercial developments for three blocks in all directions. Parking is free, but crowded. It's just off the 91 freeway at Tyler street, and served by bus routes 1, 10, 12, 13, 14, 15, 21, 27, 149, and OCTA 794. Be aware that on Friday nights and weekends this area will be extremely congested with both vehicular and pedestrian traffic. Like most American cities, Riverside is cursed with the usual chain-restaurant fare around major shopping centers. Applebee's is near the train station, TGI Fridays at the Galleria, and Denny's, IHOP and CoCo's share a corner at Iowa and University near UCR. Best Western of Riverside, 10518 Magnolia Avenue, ? +1 951 359-0770 (fax: +1 951 359-6749). Courtyard Riverside, 1510 University Avenue, ? +1 951 276-1200 (fax: +1 951 787-6783). Motel 6 Riverside East, 1260 University Avenue, ? +1 951 784-2131 (fax: +1 951 784-1801). Motel 6 Riverside South, 3663 La Sierra Avenue, ? +1 951 351-0764 (fax: +1 951 687-1430). Riverside Marriott, 3400 Market Street, ? +1 951 784-8000 (fax: +1 951 369-7127). Riverside is in an excellent location, in Southern California's Inland Empire, to take advantage of our unique geography. In Riverside you're an hour's drive away from both the sea and the mountains. The Los Angeles and Orange County beaches are accessible either via Metrolink or the 60 and 91 freeways respectively, with modest day use fees. Taking the 91 north to the I-215, then following signs for CA-30 and mountain resorts, will have you in the San Bernardino mountains in no time. Big Bear and it's surroundings are a winter playground unparalleled in much of the Southwest. For summer fun, continue up the I-215 all the way until it hits CA-138, head west, and then turn left at CA-2 to go up into the Angeles National Forest. Multitudes of picnic areas and campgrounds dot this winding road between the high desert and Los Angeles. If you turn east at CA-138, you'll run into Silverwood Lake, a large reservoir with swimming and boating facilities. Travelling to or from Riverside, California? Find flight to or from Riverside, California with an Online Travel Agency. Get lodging information or make reservations with a Local Online Hotel. Plan ahead and reserve a car with a Local Car Rental Agency. Are you relocating to Riverside, California? Goods & Services in Riverside, California.